A backup and disaster recovery plan is a must for businesses of all sizes. Since we rely so much on technology, we have to make sure our data is protected from digital threats. The days of assuming your business is safe are done. Backup and disaster recovery are not the same, but should be a package deal. Backups usually involve software or manual backups. Disaster recovery involves a structured approach for responding to unplanned incidents. Think of backup as a copy of your data, and your disaster recovery as the insurance. 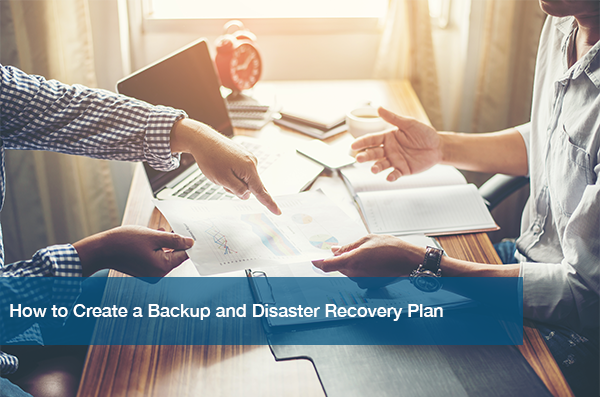 To make sure your business remains successful during a IT disaster, use these 4 guidelines to create an effective recovery plan. What Can Actually be Backed up and Restored? In a perfect world, everything has the ability to be saved. But that isn’t reality! Make sure you know what has the ability to be backed up and restored and prepare accordingly. This can all depend on your plan, but check with your IT provider just to be sure. Make sure you have a list saved of all of the physical hardware and software in your office. List them in order of priority, and should have the technical support contact information next to it in case something happens. Depending on your type of business, downtime is treated differently. Knowing where your business lies on this spectrum is important. That way, you know what type of solution you’ll need in case a disaster does hit. This way, you can ensure a cost-effective level of disaster recovery. Define your team’s roles in your recovery plan. Then, share that list of information with everyone so they can be aware of each other’s responsibilities. Also, once completed with your plan, share this with your team, too! That way, everyone is on the same page and no one goes in to panic mode when things go awry. Still Stuck on How to Create a Plan? Schedule a free IT analysis for your business from ITC. We’ll look at your systems and networks and can give you pointers on creating a plan that works for your business. At ITC, we help small businesses every day with their backup and disaster recovery. Trust your business with us to make sure your data stays safe no matter what. For more information check out the U.S Small Business Administrations’s tips for Disaster Planning.